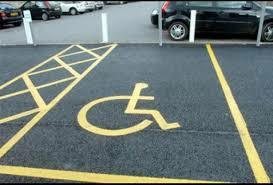 Campaigners have welcomed the decision to install what is believed to be the country’s first accessible parking bay for disabled people who need to recharge their electric vehicles. Only holders of blue parking badges who also need to recharge their electric vehicles will be allowed to use the space in the new NCP car park in Stanley Street, Salford. The idea came following a suggestion from disabled campaigner Helen Dolphin (pictured, right, with the new bay), and Libbie Bilyard (left), co-founders of the People’s Parking scheme. Dolphin, an independent mobility consultant and herself a disabled driver, came up with the idea when looking at how to make improvements to their car park accreditation scheme, which already judges services on their provision of electric charging points. She said: “I am only too aware of the increasing growth of electric vehicles and although I don’t have an electric vehicle myself, I knew that as a disabled person I would struggle to get out of my car in a standard sized bay.